It is no secret that I am a big fan of Chef Pang Kok Keong. Antoinette – a beautiful Parisian style patisserie tea salon – is one of my favourite new restaurants in 2011. Besides offering French desserts, Antoinette also has an all day dining menu which has eggs, French toast, and Blinis (French thick pancakes). There are both sweet and savoury pancakes like Blinis with blueberries ($10), and savoury Blinis with smoked salmon ($15). Pancakes are most people’s favourite brunch food for a good reason: they are fun and delicious. Everyone needs at least one reliable place for comfort food. For me, Barracks Cafe at Dempsey Hill is one of my favourite cafes in Singapore. With seven layers of fluffy pancakes, the 7-layer Pancake ($18) at Barracks Cafe is quite possibly the biggest pancake in Singapore. Definitely a must-try for pancake lovers. Over at Canopy Garden Dining & Bar, they serve a Buttermilk Pancakes ($6 with maple syrup, and $9 with ice cream). For the price, we thought that it was great value for this dish. A good pancake can be found at Cedele. They have different variations like wild blueberry, pepper corn, apple cinnamon and mushroom onion. Filled with the goodness of blueberries, Cedele’s Wild Blueberry Pancakes ($12.9) came with butter, maple syrup, salad, and choice of bacon or sausage. The pancakes ($7) from Epicurious are not out-of-this-world good. But I still love it, and I always order baked eggs and eat them together. At Food For Thought Cafe, you can choose from a variety of pancakes: have it plain with fresh cream and Gula Melaka syrup ($6); or opt for the popular combination of banana & walnuts ($10). 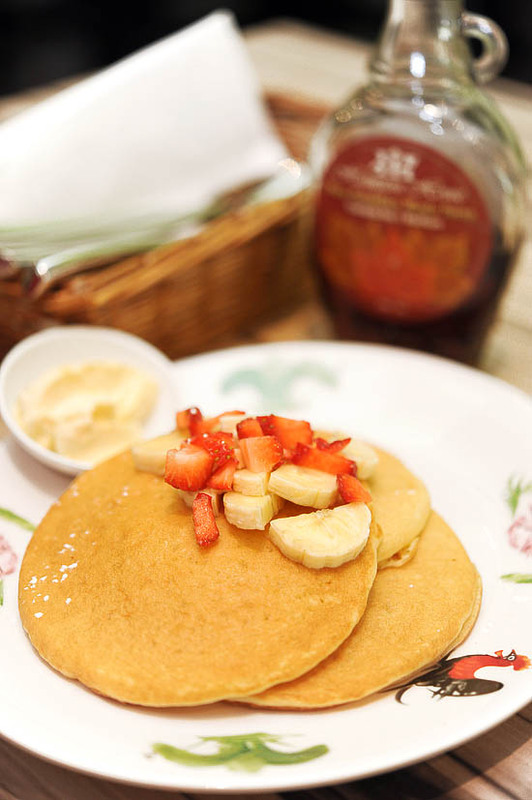 Breakfast is available from 9am to 5.30pm, let’s have pancakes for afternoon high tea. Not all pancakes are created equal. Your mission: go in search of the best pancakes in Singapore. Another place that has all day breakfast is OverEasy at One Fullerton. It is an American restaurant that serves your favourite comfort food, it is opened till late 2am. How about having some pancakes ($16) with scrambled eggs, tomatoes and bacon for supper? Prive Bakery Cafe is one of my favourite brunch places in Singapore. There’s nothing fantastic about the food, just simple, well-executed comfort food served at reasonable prices. 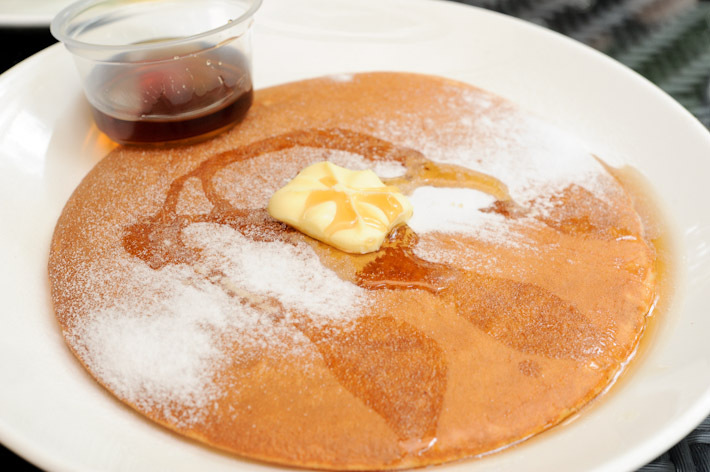 And of course, you must order the fluffy pancakes ($13.5) when you are there. Pancakes are just an excuse for me to eat maple syrup and butter. Om nom nom nom! Perched at the top of Phoenix Park in Tanglin, Spruce is a nice cafe which is just a few minutes drive from Orchard. It is extremely popular for their weekend brunch, and the Banana Hotcakes ($14) with honeycomb butter and blueberry syrup is definitely worth a try. The concept of all day dining restaurant serving only pancakes is not new – I have been to Pancakes on the Rock in Sydney which has a similar idea. 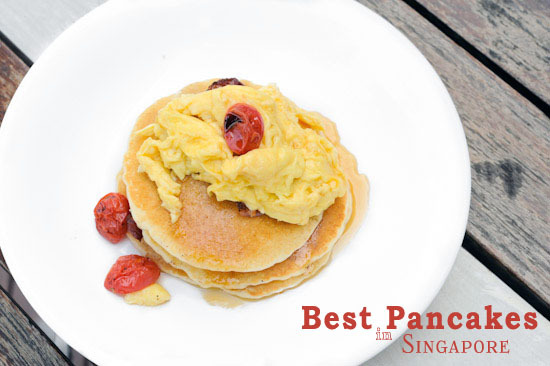 But Strictly Pancakes is certainly the first of its kind in Singapore. It is one of the few places that serve both sweet pancakes ($10) like lemon curd, strawberries, and blackforest; and savoury pancakes ($14) that come with ingredients like beef patty, salmon and garlic buttered prawns. Wild Honey at Mandarin Gallery is a breakfast speciality restaurant that serves different breakfasts from all over the world. The Canadian Pancake ($18) – a stack of classic pancakes served with wild berry, bacon and maple syrup – is one of the most popular items on their all day brunch menu. I love P.S. cafe’s strawberry pancakes! I enjoyed the pancake stack at Barracks @ Dempsey Does Artichoke offer pancakes on its menu? Did you try the chocolate pancakes at POTR when you were in Sydney? I thought they were quite delicious. I have yet to come across any chocolate pancakes in SG! Have you? IMO, I think pancakes are best eaten sweet rather than savoury!!! Guess a McDonald’s hotcakes-lover like me will always prefer to have a sweet experience with pancakes. granola pancake at food for thought is good too. eileen: try the pancakes on this list and let me know which is your favourite! ashleigh: Not a big fan of granola pancakes, but the other pancakes are lovely! where else do you go for pancakes? One of my favourite pancake places so far is at B2 of Plaza Singapura in a stall called The Bratwurst Shop. Apart from their bratwurst sausages/sandwiches, they serve all day breakfast. Lovely buttery and fluffy pancakes! there are chocolate pancakes at strictly pancakes !!! 2 fluffy pancakes served with chocolate sauce, a few pieces of strawberries and a scope of chocolate ice-cream. Know anywhere that does good Dutch pancakes? Savoury and sweet ones like apple and cinnamon, have been searching for a while and found nothing so far. @martin So far I haven’t seen any Dutch pancakes in Singapore. Will let you know if I manage to find one. Hi the pic at the top showing the pancake with stwbry is v enticing. Whr r they fr? ling: the pancakes on the blog’s header are from Ku De Ta in Bali. Sorry!!! Do you mind doing a review on Hatched ? Hi! My boyfriend and I went to Creperie des Arts last night on prinsep street, just RIGHT NEXT to strictly pancakes, and I have to say that being French, this place serves delicious authentic galettes (savoury crepes – French thin pancakes if others prefer) and sweet crepes! Accompanied with frenh cider and the meal was complete. I went to antoinette and though it was pretty yummy, it just didn’t feel real French… Especially since they use the same dough for sweet and savoury crepes! Try the galettes sarrasins while you are in Paris, and when you come back, you’ll see this place is as close as it gets to real French crepes! Now you’ve got me craving pancakes… at 5:30pm! Do you mini dutch pancakes, poffertjes? You can find them at The Central, Clarke Quay! Basement Central Market. $18 pancakes is daylight robbery and should not be endorsed. no offence intended but the pancakes that i have tasted at strictly pancakes are by far the worst pancakes ever! @Eileen Yeah Food For Thought is in my list? I just didn’t specify which pancakes because I think all of them are good! I always wanted to try spruce!! Especially attracted by the honeycomb butter! If I’m not wrong, there are Dutch pancakes at the basement of Central (the one at Clarke Quay). It’s pretty good ^_^ It’s located near Gong Cha! Have anyone heard about the new pancake outlet call Pandelicious? I think it is at upper thomson V 2, a new building. Any comments? There’s also Paddington House of Pancakes at City Square Mall. Claims to have over a 100 different types of pancakes! Today I ate at strictly pancakes and was absolutely appaled by the low standard of food and terrible service. I would highly advise everyone to stay away from that place and I deeply regret paying for the food. Best part of the experience was opening the door to leave. Yes..totally agree on Rebecca’s comment. Very much overrated. I also like Batter fluffy flaps at katong!